After six years of production, our tribute to Woody Brown is complete! We are still seeking to raise $20,000 to pay completion costs that include clearing all archival footage and music rights. All donations are fully tax-deductible when payable to Film Arts Foundation, and will be gratefully accepted. We will also be raising funds to edit the 56:40 PBS version. This is a proposal for a 56:46 television documentary profile of an extraordinary 92-year-old free spiritthe surfing, sailing and soaring legend named Woody Brown. Woody has not only lived a life full of seemingly endless adventure and accomplishment  including inventing the modern catamaran and setting world gliding records  but he has also done so with a kind of selflessness, simplicity and generosity that have made him a role model for generations of Hawaiians, both sur fers and non-surfers as well as everyone who has met him. Woody is like a modern Thoreau on a surfboard, living in harmony with the world around him, alive to the possibilities of each new day, and following his own singular vision of how to be in the world. His unique blend of enthusiasm, wisdom and spiritu makes him a truly inspirational figure. But Woodys story encompasses tragedy as well as triumph, including his struggle to come to terms with the devastating loss of his wife during childbirth, his subsequent abandonment of their infant son, and his eventual reconciliation with that son some 60 years later. These dramatic events offer the full spectrum of Woodys extraordinary life experience. OF WIND AND WAVES explores Woodys life in his own words and from the perspectives of his family and friends who have shared his journey. There is also a remarkably rich archive of film and photography from every stage of Woodys life to complement coverage of his contemporary life as an amazingly lively elder whose days are filled with service, friendship, humor, compassion, spirituality, and, up to his 90th birthday, frequent surfing. OF WIND AND WAVES also provides a valuable cross-cultural portrait of the land, people and culture of Hawaii over the six and a half decade span of Woodys life there. While the explosive economic growth of the islands has unquestionably undermined and obscured many Hawaiian traditions, Woodys story shows that the spirit of aloha remains very much alive. The telling of the story of a European American who has thoroughly embraced Hawaiian ways and values will help to create a wider appreciation for the culture and traditions of the islands. The film will also provide a needed and inspiring addition to PBS programming about vital elders and healthy aging. 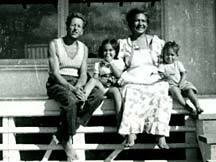 Opening montage of Woodys contemporary life  volunteer work at the Hale Makua Adult Day Health Center on Maui; the simple apartment where he lives with his third wife (he outlived the first two) and 1 5 year old son; his daily writing work; his daily surfing excursion; glimpses of contemporary Hawaii. These opening scenes establish the films rhythm and style, mixing verite scenes and sound bites from Woody, his family and friends with archival material. Woodbridge Parker Brown was born with a silver spoon in his mouth, with his family list ed in the Social Register and charter members of The 400  the roster of Americas most prominent and powerful families. Woodys father had his own immensely lucrative brokerage. But somehow, the life of privilege and prestige never appealed to Woody. He preferred to wander in the woods and on the beaches near the familys Rye retreat. It was there that his love of nature was born and it was from there that he ran away at the age of 16 in pursuit of his dream of learning to fly. Woody virtually lived at New Yorks Curtis Field where he became a protégé of Charles Lindbergh, helping prepare the Spirit of St. Louis for Lindys historic flight. 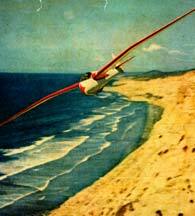 But Woody soon discovered that his true passion was for the unique world of gliders, soaring silently on invisible currents of air. His goal was to acquire the finely tuned sensitivity required to read the air and wind with nothing to hold him aloft but his own skill. Archival and re-creation footage of Woody and Bettys cross country trip, glider in tow. Early southern California surfing and soaring footage. Woody fell in love with an English beauty name Elizabeth Sellon (known as Betty) who shared his love of adventure and disdain for the trappings of society. In 1935, they spent their honeymoon driving across the country to start a new life in La Jolla, near San Diego. 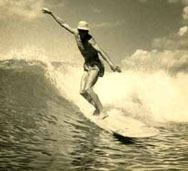 It was in La Jolla that Woody took up surfing, one of only a handful of pioneers in the new sport. He was soon designing and building his own boards, according to testimony from Don Okay, another San Diego surf pioneer and long time friend of Woodys. And as his love of soaring continued to grow, Woody became the driving force behind the design and building of Torrey Pines Flight Park, still in operation today. Archival and re-creation footage of Woodys record breaking flight in 1939, with press coverage. In 1939, Woody set world soaring records for time aloft, altitude and distance. America was still in love with aviation and Woody became an instant national hero. But Woody found the wildly enthusiastic crowds that attended a parade in his honor in Wichita Falls, Texas to be frightening. Then, as now, he had no interest in being a hero. Stylized montage of archival and contemporary images evoking the plunge from euphoria to desolation in Woodys life. 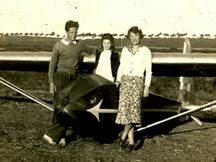 After his record-setting flight, Woody hurried home to Betty in La Jolla who was expecting their first child, an event that provided a dramatic turning point in Woodys life. Betty died giving birth to a baby boy. Woody was shattered. He recounts his own nearly suicidal depression that drove him to leave his newborn son, Jeffrey, with Bettys family, turning his back on all his worldly possessions and fleeingto the South Pacific, hoping to reach Tahiti where he thought perhaps he could begin to build a new life. Hawaii in the 40s when Honolulu was still a small town and most of Oahu was rural and unspoiled. Woody recalls his early wanderings around the undeveloped island of Oahu. First hitchhiking, then riding an old bicycle, Woody fell in love not only with the beauty of the island but also with the native people who took him in, sharing their lives and homes with him, showing him the ways of the islands with a reverence for the earth and sea that W oody had instinctively embraced since childhood but had never encountered before. The Hawaiians were ecologists before the concept existed and Woody soon came to realize that he had found his true home. The spirit of aloha had saved him. This sequence of Woodys early years in Hawaii also gives us an opportunity to hear a rich sampling of traditional Hawaiian music, including some very early and rarely heard recordings. Extraordinary archival footage from the 1940s and 50s of Hawaiis first big wave surfers such as Wally Froiseth, John Kelly and Rabbit Kekai. 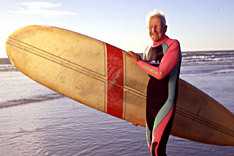 Woody renewed his interest in surfing and was soon befriended by several island residents who were taking the sport in unprecedented directions. Men like Wally Froiseth, John Kelly and Rabbit Kekai were among the first in the world to brave the huge Hawaiian surf. Because of Woodys fearless enthusiasm, these surfing giants accepted him as a mem ber of their elite group and took him on "surfing safaris" to Makaha and to Castles where Woody first experienced 25-foot waves. Woody recounts both exhilarating and terrifying surfing stories, while Wally, John and Rabbit recount their own recollections of Woodys big wave initiation. Archival footage of the Japanese attack on Pearl Harbor; archival footage of Polynesian sailing craft  outriggers and double hulled canoes; the building and launch of Woodys first catamarans. Like virtually everyone else living in Hawaii, Woodys idyllic life changed abruptly and dramatically on December 7th, 1941 when Pearl Harbor was bombed. But in Woodys case, his unique perspective on war separated him from most other young men. As Woody recounts, his status as a conscientious objector was not only unpopular, it was downright dangerous in the home of Pearl Harbor. C.O.s were routinely harassed and often beaten in Hawaii, so Woodys position was a matter of risk as well as conscience. For most of the war, Woody worked for the Army as a surveyor on other islands in the South Pacific. It was on Christmas Island that Woody first saw the Polynesian double-hulled canoes that would inspire him to revolutionize the sport of sailing. Extrapolating on the native design, Woody built the first modern catamaran. 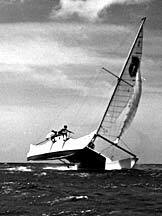 His boat, the Manu Kai, quickly became the fastest sailboat in the world. 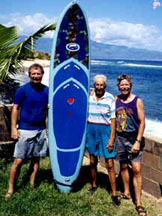 Woody, Rabbit Kekai, Hobie Alter (who built and marketed the extremely successful Hobie Cat based on Woodys design) and Woodys son, William, recall the exhilarating early days of the first catamarans in Hawaii. As more and more tourists came to the Hawaiian islands, Woody supported himself by giving thrill rides on his new boats off Waikiki Beach. Soon, Woody was being commissioned to build boats, including a 100 foot model for industrialist Henry Kaiser. Woody agreed to allow Hobie Alter to start marketing his revolutionary design. Eventually, Alter patented the design and earned a fortune selling Hobie Cats all over the world. Though it was his original design, Woody never made a penny, but as he explains with apparent conviction, he never cared about money. During this same period, Woody fell in love again with a native Hawaiian hula dancer named Rachel Brown who was the acknowledged queen of the Honolulu hula scene. Woodys and Rachels apartment located above a tavern called the Waikiki Surf Club, became a haven for their friends including dancers, surfers and anyone else who needed a meal or a place to stay. Honolulu was still a small town and the beach scene in those early years still bore a strong imprint of true Hawaiian culture. 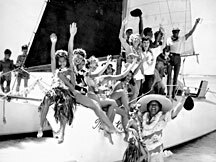 During the 50s, 60s and 70s, Woody continued his carefree life of surfing and sailing, including a wild adventure recalled for us by Wally Froiseth when Woody skippered the first Pacific crossing in a catamaran and encountered 50- foot swells that nearly swamped the boat. We see Woody sailing his catamarans in both archival and contemporary footage. 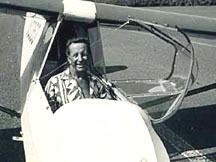 With multi-camera coverage, the film re-creates the moment in 1971 when Woody, then 59, took a glider to a Hawaiian altitude record of 12,675 feet. In these adventure sequences and re-creations, Woodys voice-over explains his philosophy of living in harmony with nature as expressed in his flying, his surfing and his sailing. Evocative scenes of the natural beauty of Hawaii; rainforest, seascapes, mountains, etc. Remarkably, the pattern of heady achievement followed by tragic loss repeated itself in Woodys life. Not long after his record setting Hawaiian glider flight, Woody lost his beloved Rachel. And once again, in tragedy Woody found a kind of salvation. Just as his loss of Betty had led him to Hawaii, losing Rachel brought him to a kind of spiritual awakening. Woody had always considered himself an agnostic, but shortly after Rachels death, he came to believe in a greater power and to embrace the importance of service to humanity as the cornerstones of his life. Woody Brown dedicated the rest of his life, a life which he has always considered to be blessed, to giving as much as he can through service to others. His sense of spirituality mixes elements of the Christian tradition with his lifelong love of nature and his sense of gratitude for the gifts he feels hes been given. If you ask him if hes a Christian, hell say no. If you ask him who he con siders his ultimate role model, hell say Jesus Christ. Once again, Woody marches to his own drummer. Perhaps the best showcase of Woodys philosophy of selfless love and service is his volunteer job at Hale Makua Adult Day Health Center. Watching his interactions with clients and staff, the film captures Woodys reflections on what the Center means to him in terms of his philosophy of life. The spirituality that has informed Woodys life s ince he lost Rachel has led to considerable reflection, including self-criticism. Woody sometimes wonders if following his bliss came at a cost to his family, including the son, Jeffrey, he left behind when he fled to Hawaii. Family reunion footage, including first meeting between Woody and his grown son, Jeffrey. Sixty-three years after Woodys sad exodus following Bettys death, a dramatic and poignant reunion between Woody and his abandoned son, Jeffrey, is captured on film. In 2002, Woody reunited with Jeffrey, Woodys youngest son William and Mary Sue, his daughter with Rachel, along with Jeffreys two daughters and their families. In candid conversations, Woody reflects on some of the life-choices he has made, admitting more than a little regret, shame and guilt, but discovering that his judgments of himself are harsher than those of others. Jeffrey insists that forgiveness is not required and that he now understands how devastated his fathe r was by his mothers death. The heart-felt conversations continue in homes, restaurants and on beach walks, with the full family expressing a wide range of emotions, at the first reunion of Woodys extended family. The reunion sequence powerfully communicates an intimate experience of joy, reconciliation, healing and forgiveness. Contemporary footage of Woody riding the waves of Maui with his family; Woodys 91st birthday party. The final act of OF WIND AND WAVES : The Life of Woody Brown ends with Woody talking about his decision to quit surfing after a bad accident. He tells family and friends at his 91th birthday party on Maui that this was a sign from above that it was time to quit. Celebrants include many old friends flown in from the mainland and Oahu to pay tribute to the unmatched aloha spirit of an extraordinary grand elder, an exemplary model of a life well-spent and o f vibrant, healthy and successful aging. A closing montage will feature contemporary scenes of Woody soaring, sailing and surfing in his beloved wind and waves, with voice-over testimonials from family and friends, and with Woodys own inimitable words. David L. Brown is an award-winning San Francisco documentary filmmaker who  since 1971 -- has produced, written and directed over 70 productions and 8 documentaries on social, nuclear, health, environmental, peace and technology issues. His documentaries have received over 70 international awards and have been broadcast on PBS and in 16 countries. See FILMOGRAPHY. Michael Anderson has been a top director of photography and cinematographer since 1967, shooting over 100 award-winning documentaries filmed all over the world. His recent credits include CROSSING THE DIVIDE (ITVS funded), THE CENTURY (ABC), LAS MADRES (Academy Award nominee), COLOR ADJUSTMENT (Marlon Riggs, Emmy Award), DIET FOR A NEW AMERICA (PBS), AT THE HEART OF HEALING (TBS), MYSTERY OF THE LAST CZAR, BROKEN RAINBOW, FROM THE ASHES..NICARAGUA TODAY, SANCTUARY, ATOMIC ARTIST, SONG OF THE CANARY andSTATEGIC TRUST. Shirley Thompson has been an editor for eighteen years and, since 1992, has specialized in Avid off-line documentary editing. Among her recent credits are ITS ELEMENTARY: TALKING ABOUT GAY ISSUES IN SCHOOL (National PBS broadcast, 1999), SCHOOL COLORS (Frontline, DuPont Columbia Award), SURFING FOR LIFE, SAN FRANCISCO IN THE 20s (for KRON, NBC affiliate in S. F.), THE MACHO MYSTIQUE (for KGO, ABC affiliate in S.F., Emmy nominee), and GREEN MEANS, a series of environmental PSAs aired nationally on PBS. Cliff Robertson, the Academy Award-winning actor (for CHARLY), will be the narrator for OF WIND AND WAVES. He knew and was inspired by Woody Brown when they both lived in San Diego in the late 1930s. Robertsons distinguished 50-year film career has included roles as John F. Kennedy, Jr. in PT 109 as well as in MIDWAY, THE NAKED AND THE DEAD, DAYS OF WINE AND ROSES, GIDGET, and THREE DAYS OF THE CONDOR. Charlie Pearson has been an award-winning documentary script writer for 25 years and his work has appeared on PBS, TBS, HBO, Showtime, Discovery, The Learning Channel, Disney and the major networks. His recent credits include the DIGITAL DIVIDE (funded by ITVS), SURFING FOR LIFE, SAN FRANCISCO IN THE 20s (for KRON, NBC affiliate), CHINATOWN (FOR KQED in S.F., aired on national PBS), WONDERS SACRED AND MYSTERIOUS (Readers Digest Video, aired on Disney), and GHOST OF THE ROCKIES for ABC. Ben Marcus was an editor at SURFER Magazine for 10 years, from 1987 to 1997. Ben met Woody Brown in 1992 while writing a SURFER profile on him, the first in any publication. He was captivated by Woody Brown and, ever since, has wanted to expand that 3,000 word story into a novel or a documentary. 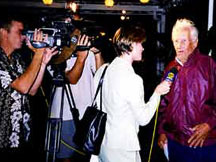 When Ben saw the film SURFING FOR LIFE, he contacted filmmaker David L. Brown to congratulate him, and accepted an invitation to contribute to a full-length documentary on Woodys life. Writer of numerous screenplays, Marcus is currently writing a television series in Malibu. Funding for OF WIND AND WAVES has been received from private donors and in-kind contributions. Completion funding will be sought from over 40 foundations which have supported media projects on Hawaiian culture, on healthy aging or the elderly. In addition, we will arrange for numerous fundraising screenings of the sample tape for people who know and love Woody Brown throughout California and Hawaii. The tape with proposal packet will be sent to additional friends of Woody Brown and select CEOs in the surfing, sailing and gliding industries. The producers will apply to ITVS in a LinCs grant with Hawai'i Public Television. The production for the documentary is over 98% completed, after intermittent production over four years. The film, with the necessary archival acquisition, can be completed within eight months after completion funding is raised. OF WIND AND WAVES will be entered into every major film and video festival which features docum entaries, including Ocean and Mountain Film Festivals. These include the Sundance Film Festival, the San Francisco International Film Festival, the International Medical and Health Film Festival and the Hawaii International Film Festival among over thirty others worldwide. For a national television broadcast, the documentary will be submitted to the P.O.V. and Independent Lens series on PBS and to all cable stations, such as HBO, Cinemax, Bravo, and Discovery Channel, which accept documentaries. Alternate public television distribution could be handled by one of the regional PBS networks such as American Public Television. The broadcasts will be publicized and promoted in major cities in cooperation with the aging, sailing, soaring and surfing communities. For international television, CS Associates, the largest distributor of American documentaries to foreign television markets, will handle the distribution. CS already represents three of Brown's documentaries. The producers will arrange premiere screenings at several key conferences on aging such as the Conference of the American Society on Aging. They will promote and publicize OF WIND AND WAVES in every periodical and magazine which reviews videos on elderly health and fitness or on surfing. This would include a major feature story in SURFER'S JOURNAL, in CATAMARAN magazine and in other surfing, sailing and soaring magazines. The completion of the documentary is budgeted at $100,000. This includes archival research and acquisition, all footage and music clearances, composing a musical score and all post-production expenses. A full proposal with budget and attachments is available upon request.